Simply put, artificial sweeteners are synthetic sugar substitutes that taste like sugar (sucrose) but have fewer calories than the regular white sugar. Therefore, a number of ‘sugar-free’ and ‘diet’ foods and beverages such as soft drinks, sports drinks, fruit juices, cereals, ice creams, chewing gums, and various baked goods use sugar substitutes instead of sugar. Plus, it is believed that artificial sweeteners can be healthy for those who are suffering from diabetes as they do not affect the blood sugar levels. However, these artificial sweeteners are still controversial as they can cause health problems, especially in sensitive individuals. Sucralose and aspartame, for instance, are linked with migraine. 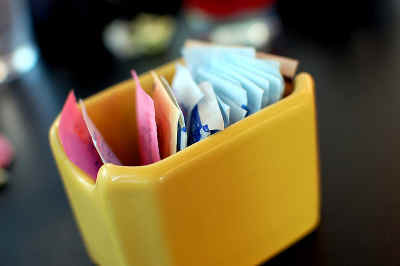 In addition, some artificial sweeteners may give rise to issues like headache and chronic fatigue. Moreover, certain scientific studies have found that these sweeteners tend to stimulate your appetite, thereby making you feel hungrier. On the other hand, non caloric sweeteners like saccharine or aspartame, and sugar alcohols like, sorbitol, mannitol, Xylitol, maltitol, and sucralose are better than sugar if you are concerned about tooth decay and dental cavities. Xylitol, in particular, has an anticariogenic effect; hence, it helps avoid cavities. When in excess, though, sugar alcohols may have a laxative effect. In addition, it is believed that Acesulfame K, another popular artificial sweetener, can stimulate insulin secretion, depending on the dosage. Thus, it may worsen reactive hypoglycemia. Though not proven completely, they are also associated with neuropsychiatric effects leading to depression, dementia, etc. Besides, it is believed that artificial sweeteners have toxic side effects and may even increase the chances of developing certain types of cancers and tumors. Thus, if you want to replace your table sugar with an artificial sugar substitute, carefully survey the label of the product you choose. Furthermore, it is best to use these products in moderation. Here’s a video explaining about the health risks associated with aspartame. The acceptable daily intake (ADI) of aspartame as per the FDA is about 50 mg/kg of body weight. The ADI for Acesulfame K and sucralose is set at 15 mg/kg is and 5 mg/kg of body weight per day respectively. Individuals dealing with a metabolism disorder known as Phenylketonuria (PKU), though, are advised against the use of aspartame. When looking for healthier alternatives, you can consider honey, date sugar, coconut palm sugar, agave nectar, stevia herb, maple syrup, palm syrup, and so on as they also work as effective sugar substitutes. These substances, however, are not calorie-free. Honey, in particular, has almost equal or even more calories than white sugar. Nevertheless, unlike sugar, it has antimicrobial, antioxidant properties, and a healthier glycemic index. Plus, natural sweeteners like honey and blackstrap molasses contain vitamins and minerals and do not have empty calories that promote obesity. Besides, vegans can use agave nectar as honey. It should not be used in excess, though, because it is high in fructose and hence encourages weight gain.